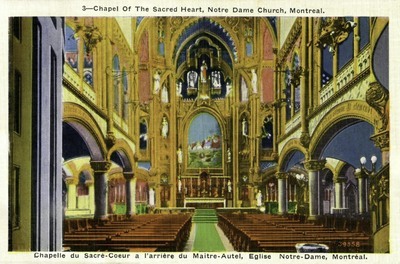 "Montreal – Chapel of the Sacred Heart, Notre Dame Church"
Chapel of the Sacred Heart, Notre Dame Church, Montreal. Chapelle du Sacré-Coeur a l'arrière du Maitre-Autel, Eglise Notre-Dame, Montreal. One color postcard with a divided back. The postcard was published by Miller Art Company in Brooklyn, New York and made in the USA.